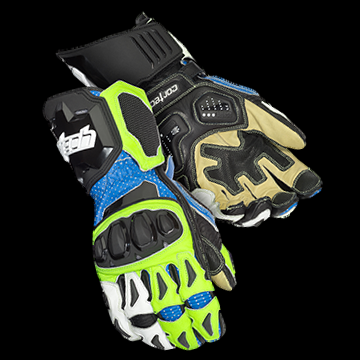 Developed and worn by our pro racers, Cortech developed this glove over several years with some of the top racers in the MotoAmerica race series. While a glove’s primary purpose is protection there is much more that goes into it- feel, comfort, and ventilation are just a few of the key issues that are refined on this glove. Developed for the track, this glove features top level construction, reversed seam finger construction and Knox SPS® Protectors. • Drum dyed top-grade 0.8-0.9mm cowhide construction. • Digital leather overlays on the palm, thumb, middle and index fingers. • CE-Approved Knox SPS® Scaphoid Protection System. • Superfabric® material in the fingers, thumb and over the ulna bone is abrasion-resistant. • Molded TPU knuckle protector has built-in flex capabilities, for added comfort. • Dual molded TPU wrist protectors. • Soft padding on outside of the glove with two layers of leather for added protection. • Dual gauntlet with a 360º full circumference wrist closure strap. • Pre-Curved palm and fingers. • Pinky and ring fingers have elastic stitching, forming a fatigue-reducing pre-curve. • Flex panels in fingers help to reduce hand fatigue and improve dexterity. • TPU knuckle and finger protectors. • Accordion flex finger knuckles. The DuPont oval, DuPont™, and Kevlar® are trademarks or registered trademarks of E.I. du Pont de Nemours and Company or its affiliates.